Magic Johnson is lending his star power to tech company Square. The 55-year-old NBA hall-of-famer and entrepreneur will join Square's board this summer, the company said. Square makes the tiny device that plugs into the headphone jack of Apple (AAPL) and Android devices to read credit cards. The payments device has been adopted by many small businesses. Square, which was founded in 2009 and is available globally, is rumored to be gearing up to go public. Its CEO is Jack Dorsey, the co-founder of Twitter (TWTR). Recently, Dorsey was named interim CEO of Twitter, as it looks for a new chief. 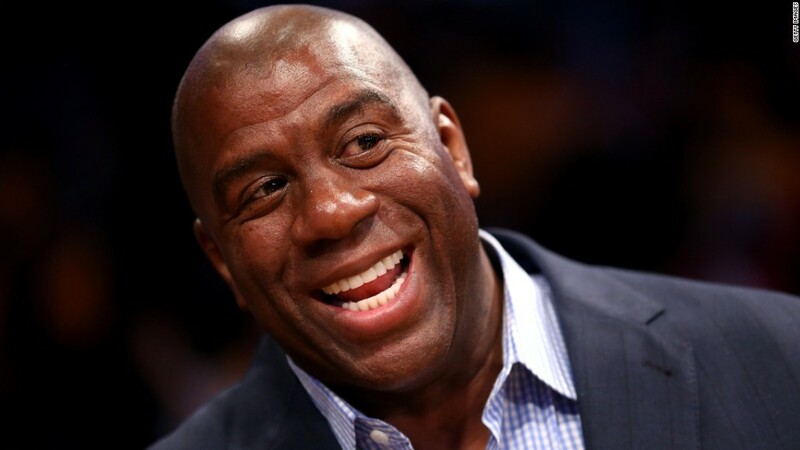 In naming Johnson to its board, Square pointed out that besides his reputation as a star player, he is also the chairman and CEO of Magic Johnson Enterprises, a company that invests in urban communities, and also runs the non profit Magic Johnson Foundation. "Adding an amazingly successful entrepreneur and advocate for economic inclusion to the Square board @MagicJohnson," Dorsey wrote on Twitter Wednesday. Johnson also tweeted that he "can't wait to get started! I'm ready to roll my sleeves up and get to work! @Square."